Premier service, unique design, and consistent excellence set our landscape contracting company apart from the rest. PapeScapes is full service design-build landscape company located in Burton, Texas. Founded by Ryan Pape in 2004, PapeScapes has been beautifying outdoor living spaces in Washington County and surrounding areas for the past 13 years. PapeScapes focuses on providing products of the utmost quality, and service that exceeds our clients’ expectations. PapeScapes has developed a tradition of design practice that responds to, as well as influences its environment. Our design process combines knowledge of history and tradition with a contemporary perspective, and our experience is second to none. Owner, Ryan Pape, was raised in Burton, and graduated from Texas A&M University in 2001 earning a Bachelor’s Degree in Landscape Architecture. During his time at Texas A&M, Ryan had the opportunity to study abroad in Castiglion Fiorentino, Italy focusing on Renaissance Art and Architecture. He departed for a period of time to gain the knowledge and skills he uses currently as a landscape contractor. He returned to the Washington County area to start his business and give back to the community that helped him become who he is today. In 2011, PapeScapes was awarded for being the 28th fastest growing business in the world founded by Texas A&M Alumni, in the Aggie 100. 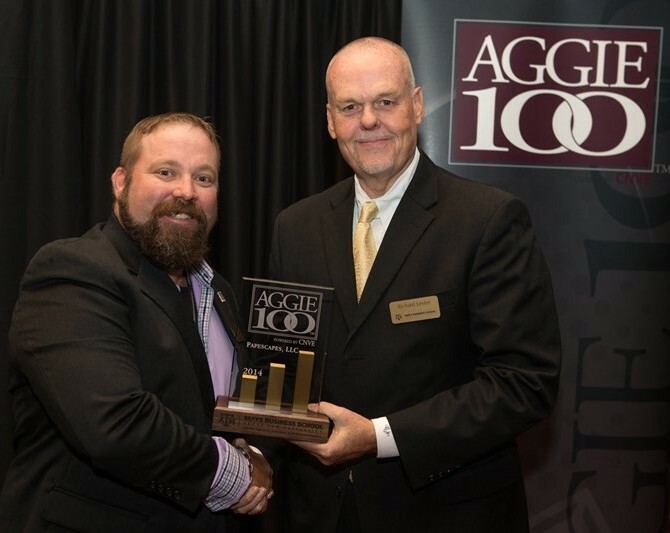 Again in 2014, PapeScapes was honored in the Aggie 100. PapeScapes has been featured for its project work in magazines such as Texas Live! Magazine and Texas Co-op Power Magazine, as well as mentioned in Texas Aggie Magazine for its accomplishments. PapeScapes is also proud to have been a part of a Wounded Warrior project in Giddings, Texas. Under his leadership, PapeScapes has grown to the company it is today.